This guest post by Peter Wolanin from the School of Chemistry demonstrates what students and researchers can achieve with their own intitiative. He spoke to us about RISE, an event he coordinated to tackle the gap in interview practice and employability he had discussed with his peers. What is the best way of preparing for a job interview? Most people would agree that attending one yourself is usually the most useful form of practice, as with many things in life, you learn quickest if you expose yourself to real-life situations. Sadly, job interviews are not easy to get and you do not really want to waste the single chance you have been given with your dream employer. Also, if you fail, then how do you find out about the things you did wrong? This can quickly turn into an egg-and-chicken problem; why not, for a change, invite an employer to a job interview instead? This is exactly what students from the Bristol Centre for Functional Nanomaterials (BCFN) and the Chemical Synthesis CDT did earlier this September. They took the initiative and organised the second edition of a one-day, practice job interview event called RISE – “Researcher Interview Skills Event”. The aim of RISE is to give postgraduate students from across the Faculties of Science and Engineering an opportunity to practice their job interview skills, improve their CVs and network with potential employers. RISE is an event for students, by students. A total of 13 different companies were invited to interview students and provide feedback on their performance – but why did they decide to come in the first place? We offered them something quite simple: they help our PhD/MSc students prepare for real job interviews and, in return, they could raise awareness of their own companies among some of the most ambitious people in Bristol. This straightforward recipe was met with great interest and many got involved, including several big names such as Rolls-Royce, MBDA Systems, Royal Society of Chemistry, AES Corporation, ISIS Innovation and, of course, the University of Bristol. 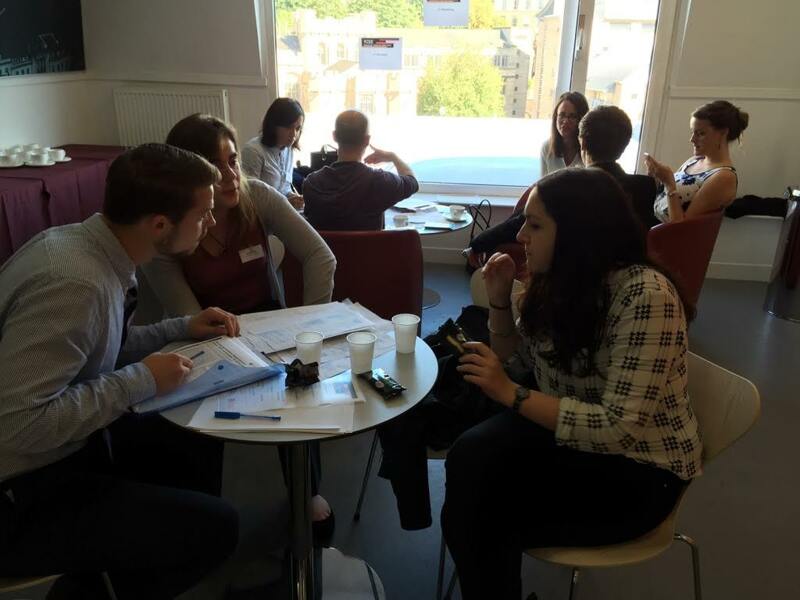 In practice, students could consult their CVs with professional advisors and take part in 2-3 job interviews each. Those were organised to be as close to reality as possible, with them being required to thoroughly prepare for the positions they chose to apply for and having to follow a formal dress code. The jobs available ranged from sectors such as academia, teaching, management, science policy, publishing and industry. A total of 45 students from 7 different schools attended the event. An extra feature of the workshop was the assessment centre, a group case-study exercise that is commonly used during many interview processes; this year, the task was to organise a conference in groups of 4-5 people and then present your plan to the CEO of your imaginary company. RISE 2015 was sponsored by the BCFN, the Chemical Synthesis CDT and the Bristol Doctoral College. The next edition is expected to take place around September 2016. Please contact Peter for more information or to offer help to run the programme next year. Rise is an event run by students for students.